Mandalastyle Placemats 2.0 with no flaring! Do you like my Mandala Style Placemats but have issues with the flaring edges? So did I… Therefore, I proudly present: Mandala Style Placemats with no flaring issues! Update: Unfortunately the original pattern for the first 7 rounds is no longer available online. I did however get the designer’s approval to translate these rounds into Swedish in the Swedish version of this pattern. This post is in Swedish but there are lots of pictures so I think you could follow along even if you do not understand Swedish. I will include a link to the Swedish version in pattern text below. Lots of text here, feel free to scroll to actual pattern if you do not want to listen to me rambling :-). You might want to cast a glance towards the end of introduction though, there will be some usefull tips there! When I made my first place mats I really had no idea what I was doing. I did not have the knowledge on how to increase rounds correctly and just increased by feeling. And of course the result showed this, and they had an issue with edges that flared a bit. I was still very happy with them and when I posted pics of them online I got a lot of requests for the pattern so I wrote it up and posted it. The pattern has become somewhat popular and there are a lot of links to it out there, so I have thougt for a long time that I really should try to update it and get rid of the flaring issues. 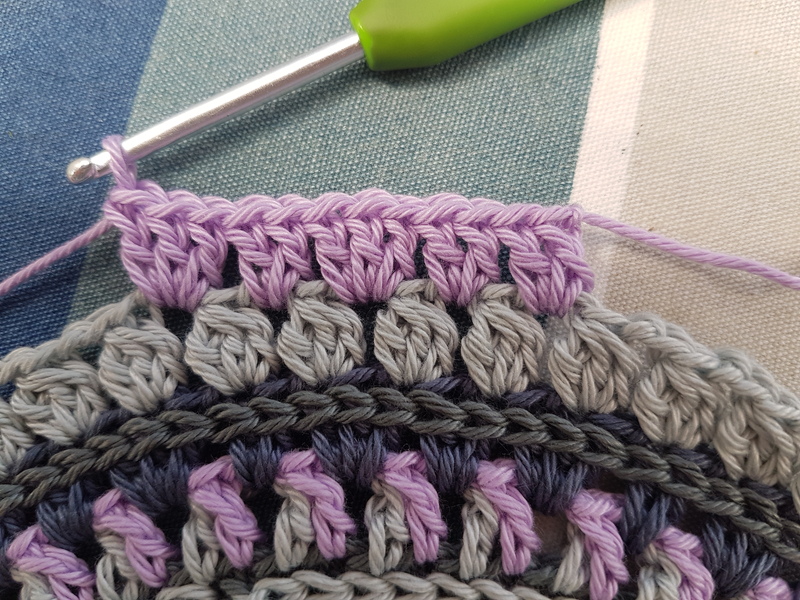 I have developed my crochet skills since then and started to understand a bit on how you should increase and such. But I really hate weaving in ends and there are A LOT of ends to weave in making these I tell you. So I have postphoned and postphoned the project. As my daughter has renovated her kitchen she really wanted me to make her placemats with purple as accent color. So I decided to give it a go and after some calculating, froggin, more calculating and more frogging I think I am really happy with the result once again! This said, these placemats need a good wet block to be totally flat. Want a stylish matching trivet to go with your placemats? Here is my pattern for Mandala Styel Tiviet Cover! The first 7 rounds are from Little Spring Mandala by Barbara Smith. You need to visit her page by the link and use her pattern for those rounds. I only state which colors I have used and show you pics of the rounds in my pattern. The rest of my pattern builds on her pattern and is basically just her pattern grown bigger. So I take this opportunity to thank Barbara for creating that goregous pattern! 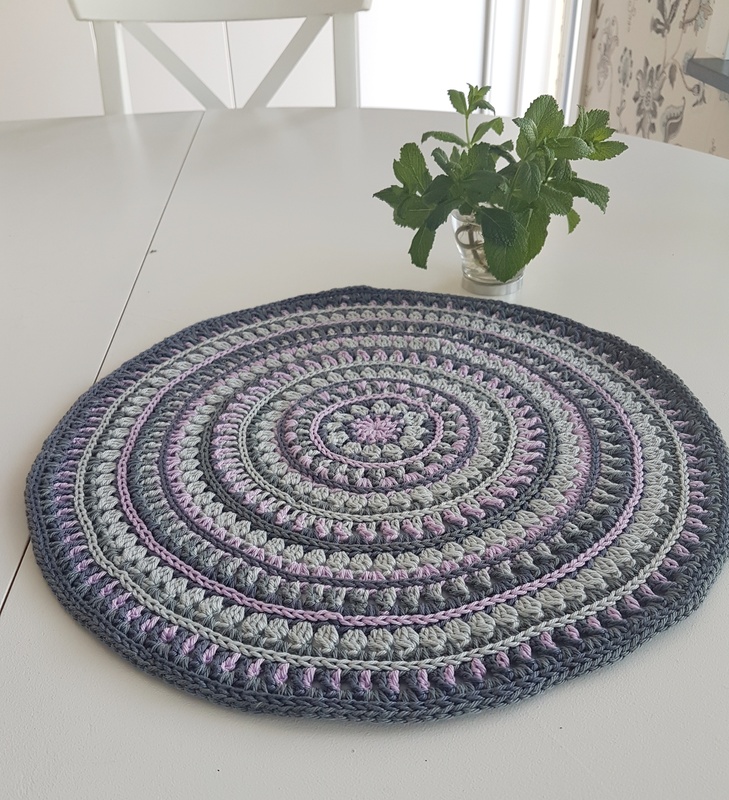 I use the cotton yarn Catania and hook no3,5, which makes the placemat about 37 cm in diameter. Whith different yarn and different hook you will get a differnt result, but this pattern lends itself to pretty much the yarn and hook of your choice. I use four colors but again, use as few or as many as you want! The weaving in of ends… Since you change color every round, some rounds are “double” and you have rounds of surface crochet ontop of that there are loads of ends to weave in. Concider yourself warned! I have tried, and really tried, to do this a lazier way and carry the yarn with me, but it does not look good in my mind. And the sole purpose of a place mat is to look good, right? Color and number of the turqouise shade is in brackets for color A in pattern. Number of stitches and chainspaces for each round are stated in brackets after round. 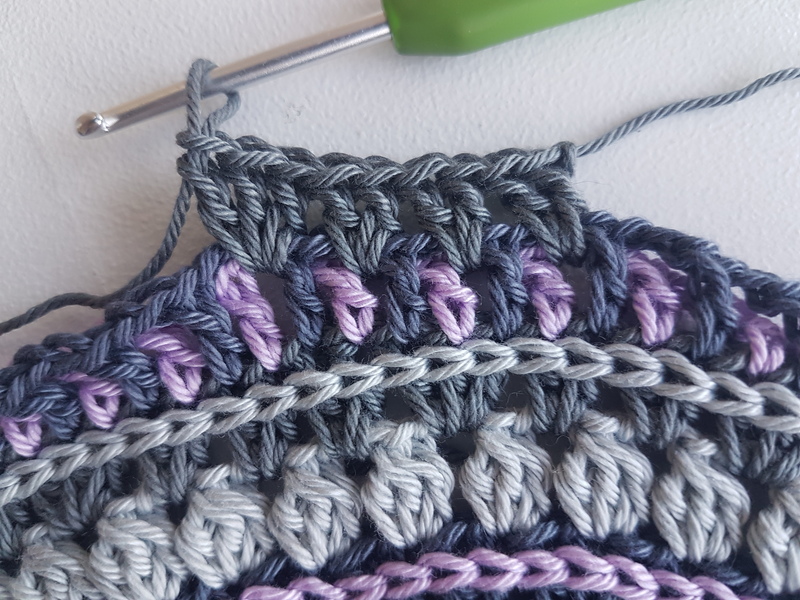 You know you can print a copy of this pattern using Printfriendly, right? And it gives you the possibility to edit out text and pics you do not want to print. Really handy! Please bear in mind tension is individual so you might need more (or less) yarn than I do. All rounds except for round 1 starts with a standing sc, standing dc or standing 3dctog. This will not be specified in pattern. You start all rounds except for round 1 in st or chsp of your choice. Here you find tutorials for standing sc and standing dc. When you know your standing dc you can easily make a standing 3dctog. All rounds that concist of only dc will look the best if you start them with a standing dc and join them wit an invisible join. This way no one is going to be able to tell where your round starts or ends. For the other rounds the joins will be hidden by the next rounds so you can join them wit a slip stitch. Yarn over, insert hook in indicated stitch (or chain space), yarn over, pull through, yarn over, pull strough 2 loops (2 loops on hook), yarn over, insert hook in indicated stitch, yarn over, pull through, yarn over, pull through 2 loops on hook (3 loops on hook), yarn over, insert hook in indicated stitch, yarn over, pull through, yarn over, pull through 2 loops on hook (4 loops on hook), yarn over, pull throuhg all loops on hook. Done! If you click the pics they will show bigger. For round 1-7 follow this pattern, Little Spring Mandala, with colour changes as indicated below. 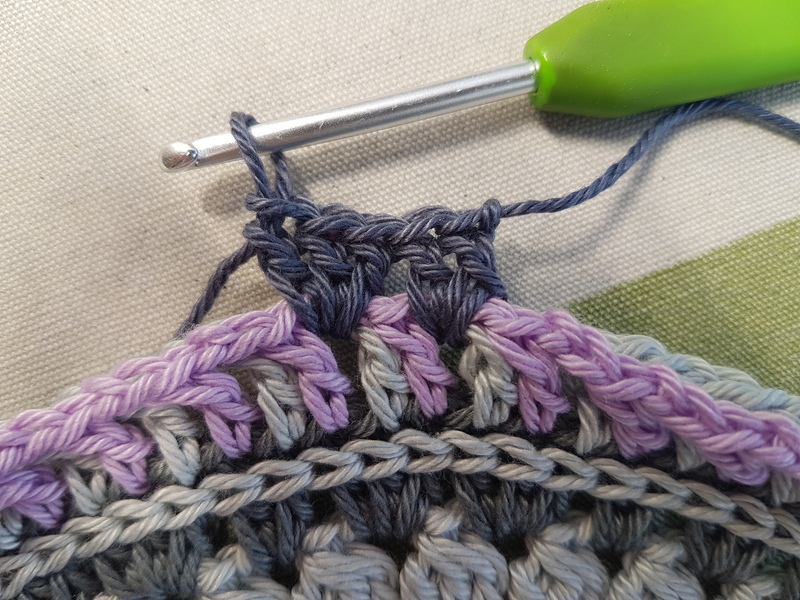 You can leave the yarntail on front of the crochet, in the end of the pattern I will show you a way to make the join of this round invisible. Hint: I usually wait with round 5 until I have completed the round coming after. Sorry for bad colour on 3 last pics and pic for row 7, they were taken in the evening and we are loosing light in Sweden 🙂 For clearer pics of on how to make row 6:a and 6.b, se round 12:a and 12:b. This round is worked into round 7. See the sequence of st that is repeated in pic below. See sequence repeated in pic below. All that is left to do is weaving in ends and blocking your placemat! Thread yarn on needle and insert needle under the first sl st of round, from middle and out. Now insert needle in loop of last sl st of round and pull yarn out on the back of your work. You now basically have sewn a slipstitch and it is impossible to tell where round starts and ends! 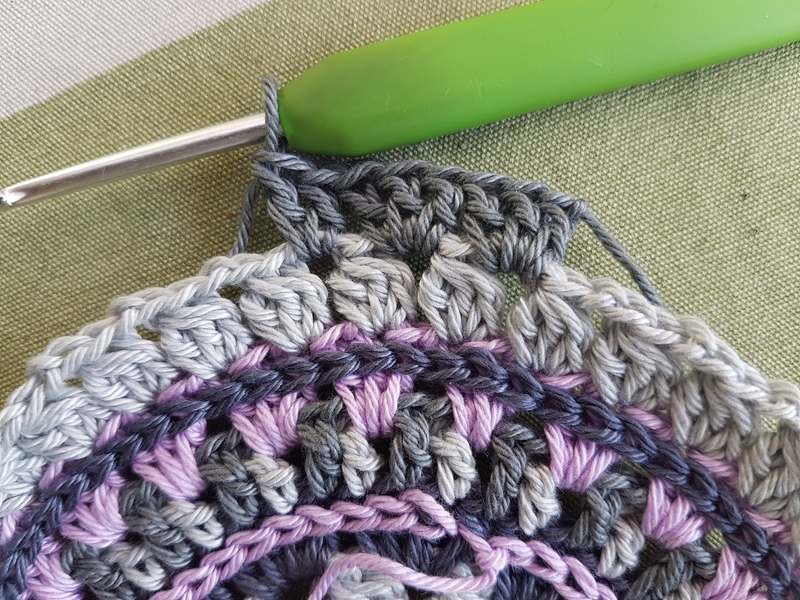 22 June, 2017 in Crochet, Crochet, Gift ideas, Miscelanious, My patterns. ← Bordstabletter Mandalastyle 2.0 utan vågiga kanter! I love this design! 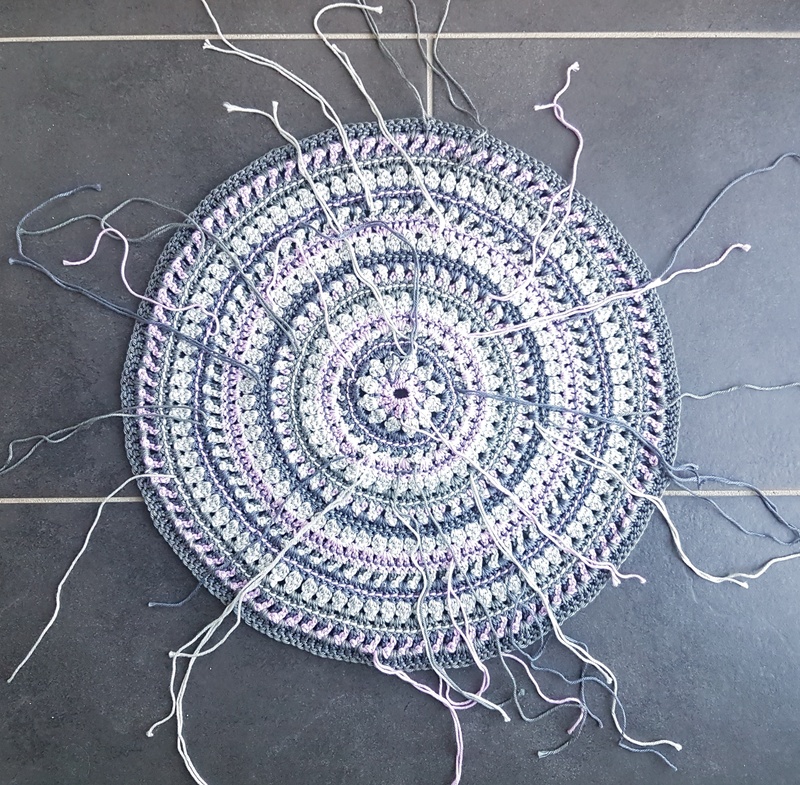 I really want to make a bigger version of it to make a small rug – how would I amend the pattern to do that? You would have to calculate and increase rounds, I cannot supply calculation for that. Another easier way to go about it would be to use bulky yarn and large hook, that would give you a larger piece suitable for a rug. There is nice “spagetti” yarn that I think would work. Hi! Sorry for late answer, I have been on holliday! I think if you used a really thick yarn it would grow as a rug by itself. 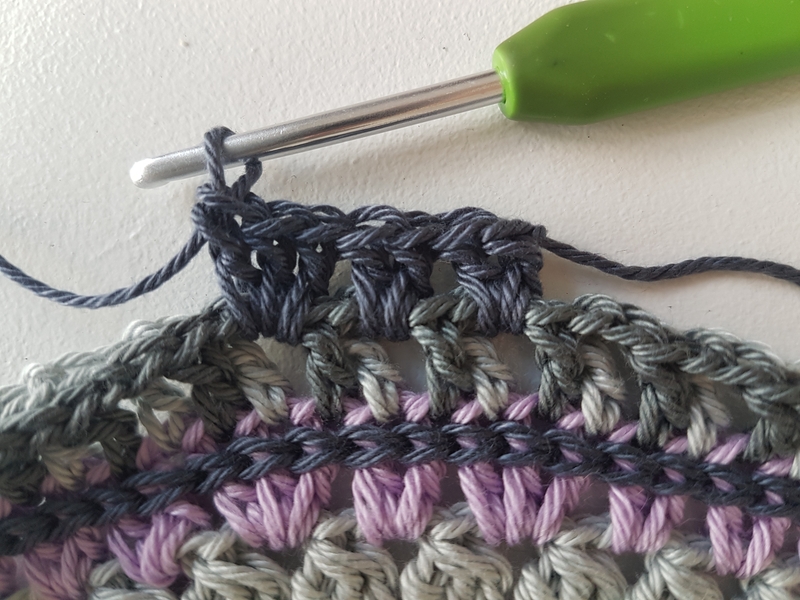 Otherwise you have to continue the pattern, taking into account to decrease the number of increase of stitches on each round by 1 per repeat (you increase every stitch in round 1, every other in round 2, every third in round 3 and so on). The way the pattern goes you might have to adjust and not increase for 1 round, but add your increases to next round. I really do not know how to explain this, it took me like 3 days to figure out the ones for this pattern as math is not my speciality. I know that Helen on Crystals and Crochet did a post on this but I cannot find it at the moment. Good luck! Nice! I know you didn’t ask for advice, but you might like this idea. 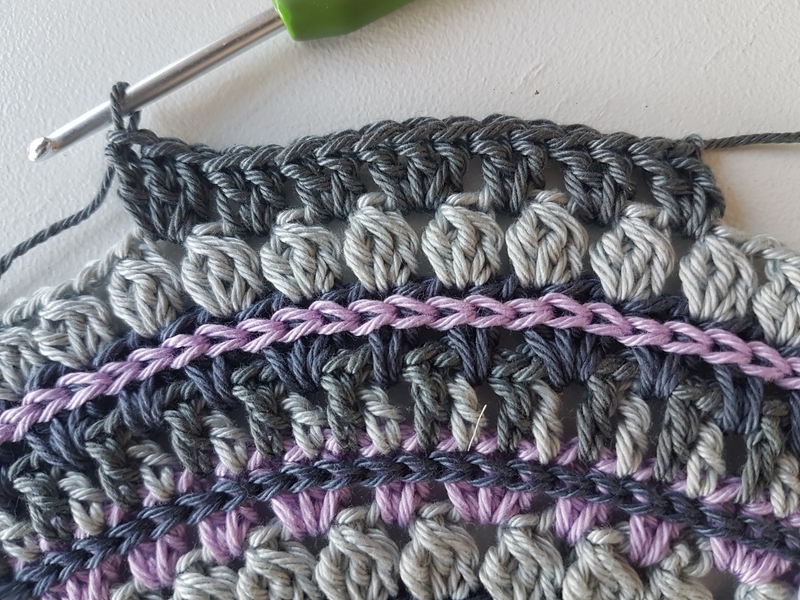 I always, always, without fail, weave in ends as I progress through a piece by crocheting over it. That’s the beginning & ending tails as you change colors or add new skeins. It reduces stress. I do the same but have experienced the work unravels pretty easily with time if you only do that. So I always also sew them back about 3 cm and then turn and sew them forwards the same length making the weave turn twice. This holds the ends even when machine washing.